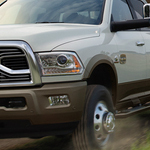 Known as America's workhorse, the 2018 Ram 3500 leads its class in capability and power. This popular heavy-duty pickup truck boasts a myriad of capability features all designed to prove its prowess in any driving and hauling situation. Offering a maximum payload capacity of 7,350 pounds, this truck is up to tackle any hauling task. An innovative Snow Chief Package gives drivers the option of choosing to upgrade their Ram with features engineered to plow up to 1,265 pounds. The Ram experts and enthusiasts at Charbonneau Chrysler Center know all of the ins and outs of the 2018 Ram 3500 truck. Our professional team of associates is ready to answer all of your questions while we demonstrate to you all of the venerable capability features of this classic workhorse. We look forward to serving you today and to taking you out for a test drive on this heavy-duty pickup truck.